A tattoo is the result of the deposition of exogenous pigment into the skin. This may be purposeful or accidental. Accidental tattoos may occur after abrasion injuries introducing asphalt, graphite, or carbon into the injured skin. Rarely, medically induced tattoos have developed after the use of ferrous subsulfate solution (Monsel's solution) for coagulation purposes. While traumatic tattoos are not rare, decorative tattoos are more common. Tattooing has been practiced for thousands of years for purposes of identification, group affiliation and protection, and artistic expression. In the modern world, tattooing is often done by tattoo artists using electric needles to introduce particles of pigment into the dermis. Other tattooists may use any pointed object to place pigment particles into the various layers of the dermis or epidermis. Tattooing remains a common custom in many countries and cultures. It gained popularity in Western countries throughout the 1990s. In the past, decorative tattoos were primarily seen in men, especially in groups such as sailors and members of the armed forces; however, in North American culture today, they are increasingly observed in young professionals of both sexes. The components of many tattoo pigments have been identified, although new formulations continue to appear (see Tattoo Pigments, below). Complications resulting from decorative tattoos are surprisingly rare, but the incidence is increasing. [1, 2, 3, 4] The introduction of foreign substances into the skin can result in a number of adverse effects, including toxic or immunologic reactions to the tattoo pigments, transmission of infectious diseases, and the localization of skin disease within the tattoo. An immunologic reaction to a tattoo may be an acute inflammatory reaction or an allergic hypersensitivity. The histopathologic pattern can be granulomatous, lichenoid, or pseudolymphomatous. Types of reactions include but are not limited to acute inflammatory reactions, granulomatous reactions, lichenoid reactions, sarcoid reactions, photo-aggravated reactions, and MRI sensitivity reactions. Images courtesy of Science Photo Library (top left), NIH (top and bottom right; center), and Medscape Drugs & Diseases (bottom left). Motivation for the removal of tattoos varies among individuals. The reasons can range from feelings of regret to the development of an adverse reaction in the skin. Many tattoo removal methods exist. Also see Tattoo Lasers. Although infection secondary to tattoos is currently unusual, infection may be introduced into the skin during the breach of the epidermal barrier. Bacterial infections may be limited but sometimes result in true erysipelas, gangrene, or systemic sepsis. The infections can range in severity from a mild, localized infection to bacterial sepsis. A 2017 case report describes a man becoming infected with Vibrio vulnificus after swimming in the Gulf of Mexico 5 days after the completion of a leg tattoo. The patient died from septic shock; his chronic liver disease was cited as a possible contributing factor. Abscess formation, methicillin-resistant Staphylococcus aureus positive. (a) Initial presentation, (b) after abscess surgery, (c) after systemic antibiotics and negative-pressure wound therapy. A 31-year-old man presented with malaise and a painful abscess on the right shoulder. The oozing lesion was situated within an incomplete tattoo (a). Image courtesy of the National Institutes of Health. Acute inflammatory reactions are associated with physical tissue injury and the injection of pigment, dyes, or metals into the skin. This reaction usually recedes without consequence within 2-3 weeks and is an expected adverse effect of the tattooing process. Once any acute inflammatory changes have resolved, the most frequent reaction observed with tattoos is an allergic sensitivity to one of its pigments. Individuals may manifest sensitivity to a particular pigment in several ways. Histopathologic evaluation of involved skin may reveal a spongiotic, granulomatous, or lichenoid type of tattoo reaction. Commonly, hypersensitivity reactions to a tattoo pigment result in a contact dermatitis or photoallergic dermatitis. These conditions may manifest clinically as localized eczematous eruptions or, rarely, as an exfoliative dermatitis. Histopathologic findings include acanthosis, spongiosis, and a lymphocytic perivascular infiltrate. Allergic contact dermatitis reaction. Image courtesy of the National Institutes of Health. 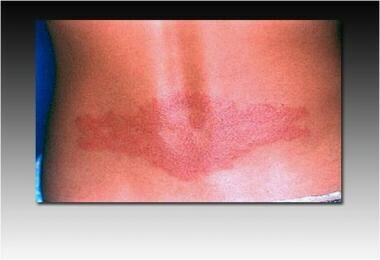 Allergic reactions to red tattoo pigments are the most common and may be caused by a variety of pigments. This was previously thought to be due to mercury in the pigment, but mercury is no longer used in the majority of dyes, yet red tattoo reactions continue to occur. Patch testing may be positive for mercuric chloride but is not reliable for cinnabar. Alternative red dyes have been developed because of the problems associated with red tattoo pigment containing mercury; however, red tattoo reactions continue to occur. Intense inflammatory reaction to the tattoo's red ink. A 17-year-old healthy girl presented with a severe, partly bullous inflammatory reaction with marked circumscribed edema, shivering, nausea, and vomiting for two days after tattooing with a red ink (first panel). She had the black tattoo for months without any adverse events. Image courtesy of the National Institutes of Health. Large ulceration in a tattoo. 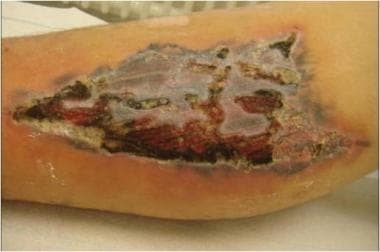 A 33-year-old man presented with a superficial ulceration about 4 weeks after a red tattoo on his forearm. Microbial swabs remained negative. His medical history was uneventful and he was in good general health. No reason for this uncommon reaction could be identified. Image courtesy of the National Institutes of Health. Bullous eczema allergic reaction to a henna skin decoration. Image courtesy of the National Institutes of Health. Photo-aggravated reactions are most commonly caused by yellow (cadmium sulfide) tattoo pigment. Edema and erythema may develop upon exposure to sunlight. Although the mechanism is not clear, cadmium sulfide is the light-sensitive material used in photoelectric cells; therefore, the reaction is believed to be phototoxic. Red tattoos have been associated with photo-aggravated tattoo reactions less frequently than yellow tattoos, and these reactions may relate to the trace amounts of cadmium added to brighten the red pigment. Blue tattoos that contain cobalt aluminate have been linked to localized hypersensitivity reactions and (rarely) the spontaneous development of uveitis. Granulomatous reactions may take two forms. Foreign body reaction to pigment can produce numerous pigment-filled giant cells. This reaction may be viewed as the counterpart to an irritant contact dermatitis. An immunologic granulomatous reaction is characterized by aggregates of epithelioid cells, a ring of lymphocytes, and a few giant cells. An immunologic granulomatous reaction may be indistinguishable from tattoo involvement seen as a Koebner response in sarcoidosis; therefore, further investigation, such as a complete review of systems and possibly chest radiography, may be warranted to look for systemic disease. Most commonly, red pigment is associated with a granulomatous tattoo reaction; however, several reactions involving chromium (green pigment) and cobalt (blue pigment) have also been reported. In contrast to an eczematous hypersensitivity tattoo reaction in which patch test results may be positive, granulomatous tattoo reactions are associated with negative patch test results. Manganese reportedly causes a granulomatous reaction in purple tattoos, but sufficient evidence is not available to establish manganese as the definitive etiologic agent. [19, 20] One patient was documented with a granuloma occurring in the violet areas of a tattoo shown to contain aluminum particles. Intradermal provocation testing to aluminum was positive in this patient. Lichenoid hypersensitivity tattoo reactions are less common than eczematous reactions. Evidence exists that the lichenoid reaction is an expression of delayed hypersensitivity to a lymphocytic T-cell infiltrate, which may simulate the graft-versus-host response. Mercury (red pigment) is responsible for most lichenoid tattoo reactions. Clinically, warty papules or plaques typical of hyperkeratotic lichen planus are usually confined to the red portion of the tattoo, although a generalized lichen planus–like reaction developed in one patient with a history of a lichenoid tattoo reaction. This patient had occupational exposure to mercury. Histopathologically, the pattern of inflammation is consistent with that of lichen planus, including a bandlike infiltrate at the dermoepidermal junction, liquefaction degeneration, hyaline bodies, and sawtooth rete ridges. Similar to granulomatous tattoo reactions, lichenoid reactions are associated with negative patch test results. Delayed hypersensitivity to tattoo pigment may result in a pseudolymphomatous reaction. Lymphadenosis benigna cutis (pseudolymphoma) can develop after a variety of foreign substance exposures including insect bites, acupuncture, antigen injections, earrings, and tattoos. Tattoo-induced pseudolymphoma occurs primarily within red portions of the tattoo. This reaction is rarely induced by green or blue tattoos. Clinically, most reactions are characterized by flesh-to-plum or plum-red indurated nodules and plaques similar to cutaneous B-cell lymphoma. Be alert to this type of reaction to tattoo pigment to prevent an erroneous diagnosis of lymphoma. Pseudolymphoma may be distinguished from cutaneous lymphoma at histologic examination. Important features of a pseudolymphoma include germinal centers, a mixed cell infiltrate, prominent vasculature, and predominant involvement of the upper dermis compared with the lower dermis. Immunohistochemical studies may provide additional information that helps distinguish pseudolymphoma from malignant B-cell proliferation in the skin. Monotypic light-chain expression highly suggests malignant lymphoma, while the lymphocytes in pseudolymphoma primarily are polyclonal. Several cutaneous disorders show a predilection for tattooed skin. The eruption may represent the initial manifestation of the disease or the accentuation of an existing disorder in the area of the tattoo. Lichen planus, psoriasis, sarcoidosis, and lupus erythematosus have been associated with localization to the site of a tattoo. No color predilection is demonstrated in this localization response. Whether disease localized to the tattoo represents the Köebner phenomenon or results from a locus minoris resistentiae that predisposes the area to disease is unclear. Several cases of skin cancer occurring at the site of tattoos have been reported, including squamous cell carcinoma, basal cell carcinoma, and melanoma. 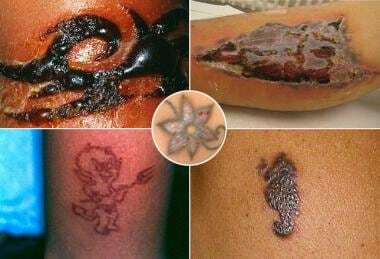 While tattooing results in the deposition of metallic salts and organic dyes in the skin, potentially for the remainder of the recipient's lifetime, the carcinogenic effects remain unclear. Several patients with malignant melanoma occurring in a tattoo have been reported. Most of these documented cases include melanomas found in tattoo sites used for marking an irradiation field. The combination of India ink and irradiation may be responsible for carcinogenesis. While the association may be coincidental, further research is needed to explore this relationship. Most often, tattoo removal is sought for social or esthetic reasons. Decorative tattoo removal can be accomplished by a variety of methods. Treatment modalities used in the past include salabrasion, cryosurgery, dermabrasion, carbon dioxide lasers, and cold-steel surgical excision. These destructive methods replaced the tattoo with a permanent scar. In 1964, Goldman et al were the first to describe the removal of tattoos with the Q-switched ruby laser. These experiments were successful; however, the technique did not gain popularity until the 1990s. Laser tattoo removal often requires multiple treatments, and complete resolution of color may not be achieved in all cases. Laser tattoo removal targets tattoo pigment-containing structures in the skin using the theory of selective photothermolysis. To achieve selective photothermolysis, sufficient energy to damage the target needs to be delivered with a pulse duration that is less than the thermal relaxation time of the target, which is itself defined by the size and shape of the target. The smaller the target, the shorter the thermal relaxation time and therefore the shorter the laser pulse duration required. The thermal relaxation time of tattoo pigment particles is less than 10 nanoseconds, suggesting that energy delivery in the picosecond range (1 trillionth of a second, 10-12 seconds) should be effective. Historically, the Q-switched lasers (nanosecond duration, 10-9 seconds) ruby (694 nm), Q-switched Nd:YAG (1064 nm), Q-switched alexandrite (755 nm), Q-switched frequency-doubled Nd:YAG (532 nm), and the pigmented lesion pulsed dye (510 nm) lasers have been used to remove various tattoo pigments. Recently developed picosecond laser systems generate significant photomechanical effects, which lead to a more effective mechanical breakup of the ink or pigment particles. Using picosecond pulses allows lower treatment fluences to be used, while keeping the peak tensile stress induced substantially higher than that typically produced with Q-switched lasers. Selection of the appropriate wavelength is determined by the colors of tattoo pigment to be targeted. Based on “complementary matching” of tattoo pigment, green tattoo pigment is most effectively removed by 694-nm or 755-nm wavelengths and red tattoo pigment is best removed with 532-nm wavelength. Blue and black pigments are removed with any wavelength. More difficult to remove are yellow and orange pigments; these are often treated with 532-nm wavelength. Before laser treatment, tattoo pigment is localized within perivascular fibroblasts, mast cells, and macrophages. After treatment with a Q-switched or picosecond laser, rapid thermal expansion fragments the pigment-containing cells causing the pigment to become extracellular. The release of ink particles into the extracellular space allows for lymphatic drainage and rephagocytosis of the smaller residual ink particles. To a lesser extent, elimination of pigment by formation of scale-crust may be involved. Laser-induced photochemical changes can occur in tattoo inks resulting in irreversible immediate darkening of the tattoo. Pigments, including red, brown, and white, used for cosmetic tattoos are at highest risk for this type of reaction. The darkening reaction may be masked by an immediate whitening action after laser treatment. The immediate whitening of the tattoo is likely caused by the formation of gas bubbles that intensely scatter light. A small test area is advised because this transient whitening reaction may obscure the darkening reaction. Most cosmetic tattoos contain iron (or titanium) oxide inks that, on laser irradiation, are reduced from ferric oxide to the ferrous oxide form; the latter being black and insoluble. Although this reaction pattern can usually be improved with continued laser treatments or vaporization with a carbon dioxide laser, the darkened color may be permanent. Sanghavi SA, Dongre AM, Khopkar US. Tattoo reactions-an epidemic on the surge: A report of 3 cases. Indian J Dermatol Venereol Leprol. 2013 Mar-Apr. 79(2):231-4. [Medline]. Ortiz AE, Alster TS. Rising concern over cosmetic tattoos. Dermatol Surg. 2012 Mar. 38(3):424-9. [Medline]. Greywal T, Cohen PR. Cosmetic tattoo pigment reaction. Dermatol Online J. 2016 Jul 15. 22 (7):[Medline]. Islam PS, Chang C, Selmi C, Generali E, Huntley A, Teuber SS, et al. Medical Complications of Tattoos: A Comprehensive Review. Clin Rev Allergy Immunol. 2016 Apr. 50 (2):273-86. [Medline]. Hendren N, Sukumar S, Glazer CS. 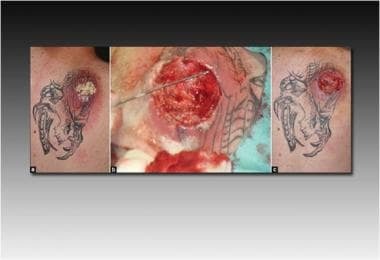 Vibrio vulnificus septic shock due to a contaminated tattoo. BMJ Case Rep. 2017 May 27. 2017:[Medline]. Baxter SY, Deck DH. Tattoo-acquired verruca plana. Am Fam Physician. 1993 Mar. 47(4):732. [Medline]. Miller DM, Brodell RT. Verruca restricted to the areas of black dye within a tattoo. Arch Dermatol. 1994 Nov. 130(11):1453-4. [Medline]. FDA Consumer Health Information. Inks Used in Certain Tattoo Kits Cause Infections. US Food and Drug Administration. Available at http://www.fda.gov/ForConsumers/ConsumerUpdates/ucm316357.htm. Accessed: August 11, 2014. Serup J. Tattoo Infections, Personal Resistance, and Contagious Exposure through Tattooing. Curr Probl Dermatol. 2017. 52:30-41. [Medline]. Hutton Carlsen K, Køcks M, Sepehri M, Serup J. Allergic reactions in red tattoos: Raman spectroscopy for 'fingerprint' detection of chemical risk spectra in tattooed skin and culprit tattoo inks. Skin Res Technol. 2016 Mar 14. [Medline]. Jovanovic DL, Slavkovic-Jovanovic MR. Allergic contact dermatitis from temporary henna tattoo. J Dermatol. 2009 Jan. 36(1):63-5. [Medline]. Jacob SE, Castanedo-Tardan MP, Blyumin ML. Inflammation in green (chromium) tattoos during patch testing. Dermatitis. 2008 Sep-Oct. 19(5):E33-4. [Medline]. Gallo R, Parodi A, Cozzani E, Guarrera M. Allergic reaction to India ink in a black tattoo. Contact Dermatitis. 1998 Jun. 38(6):346-7. [Medline]. Tope WD, Arbiser JL, Duncan LM. Black tattoo reaction: the peacock's tale. J Am Acad Dermatol. 1996 Sep. 35(3 Pt 1):477-9. [Medline]. Treudler R, Tebbe B, Krengel S, Orfanos CE. Allergic contact dermatitis from black tattoo. Contact Dermatitis. 1997 Dec. 37(6):295. [Medline]. Ravits HG. Allergic tattoo granuloma. Arch Dermatol. 1962 Sep. 86:287-9. [Medline]. Verdich J. Granulomatous reaction in a red tattoo. Acta Derm Venereol. 1981. 61(2):176-7. [Medline]. Tazelaar DJ. Hypersensitivity to chromium in a light-blue tattoo. Dermatologica. 1970. 141(4):282-7. [Medline]. Nguyen LQ, Allen HB. Reactions to manganese and cadmium in tattoos. Cutis. 1979 Jan. 23(1):71-2. [Medline]. Schwartz RA, Mathias CG, Miller CH, Rojas-Corona R, Lambert WC. Granulomatous reaction to purple tattoo pigment. Contact Dermatitis. 1987 Apr. 16(4):198-202. [Medline]. McFadden N, Lyberg T, Hensten-Pettersen A. Aluminum-induced granulomas in a tattoo. J Am Acad Dermatol. 1989 May. 20(5 Pt 2):903-8. [Medline]. Vagefi MR, Dragan L, Hughes SM, Klippenstein KA, Seiff SR, Woog JJ. Adverse reactions to permanent eyeliner tattoo. Ophthal Plast Reconstr Surg. 2006 Jan-Feb. 22(1):48-51. [Medline]. Clarke J, Black MM. Lichenoid tattoo reactions. Br J Dermatol. 1979 Apr. 100(4):451-4. [Medline]. Taaffe A, Knight AG, Marks R. Lichenoid tattoo hypersensitivity. Br Med J. 1978 Mar 11. 1(6113):616-8. [Medline]. Garcovich S, Carbone T, Avitabile S, Nasorri F, Fucci N, Cavani A. Lichenoid red tattoo reaction: histological and immunological perspectives. Eur J Dermatol. 2012 Jan-Feb. 22(1):93-6. [Medline]. Taaffe A, Wyatt EH. The red tattoo and lichen planus. Int J Dermatol. 1980 Sep. 19(7):394-6. [Medline]. Blumental G, Okun MR, Ponitch JA. Pseudolymphomatous reaction to tattoos. Report of three cases. J Am Acad Dermatol. 1982 Apr. 6(4 Pt 1):485-8. [Medline]. Ploysangam T, Breneman DL, Mutasim DF. Cutaneous pseudolymphomas. J Am Acad Dermatol. 1998 Jun. 38(6 Pt 1):877-95; quiz 896-7. [Medline]. Zinberg M, Heilman E, Glickman F. Cutaneous pseudolymphoma resulting from a tattoo. J Dermatol Surg Oncol. 1982 Nov. 8(11):955-8. [Medline]. Patrizi A, Raone B, Savoia F, et al. Tattoo-associated pseudolymphomatous reaction and its successful treatment with hydroxychloroquine. Acta Derm Venereol. 2009. 89(3):327-8. [Medline]. Rijlaarsdam JU, Bruynzeel DP, Vos W, Meijer CJ, Willemze R. Immunohistochemical studies of lymphadenosis benigna cutis occurring in a tattoo. Am J Dermatopathol. 1988 Dec. 10(6):518-23. [Medline]. Jones MS, Maloney ME, Helm KF. Systemic sarcoidosis presenting in the black dye of a tattoo. Cutis. 1997 Mar. 59(3):113-5. [Medline]. Goldenberg G, Patel S, Patel MJ, Williford P, Sangueza O. Eruptive squamous cell carcinomas, keratoacanthoma type, arising in a multicolor tattoo. J Cutan Pathol. 2008 Jan. 35(1):62-4. [Medline]. Kluger N, Minier-Thoumin C, Plantier F. Keratoacanthoma occurring within the red dye of a tattoo. J Cutan Pathol. 2008 May. 35(5):504-7. [Medline]. Kluger N, Koljonen V. Tattoos, inks, and cancer. Lancet Oncol. 2012 Apr. 13 (4):e161-8. [Medline]. Soroush V, Gurevitch AW, Peng SK. Malignant melanoma in a tattoo: case report and review of the literature. Cutis. 1997 Mar. 59(3):111-2. [Medline]. Kluger N. [Tattoo skin reactions: Management and treatment algorithm]. Ann Dermatol Venereol. 2016 Jun-Jul. 143 (6-7):436-45. [Medline]. Goldman L, Wilson RG, Hornby P, Meyer RG. Radiation from a Q-switched ruby laser. Effect of repeated impacts of power output of 10 megawatts on a tattoo of man. J Invest Dermatol. 1965 Jan. 44:69-71. [Medline]. Brodell RT. Retattooing after the treatment of a red tattoo reaction with the CO2 laser. J Dermatol Surg Oncol. 1990 Aug. 16(8):771. [Medline]. Kyanko ME, Pontasch MJ, Brodell RT. Red tattoo reactions: treatment with the carbon dioxide laser. J Dermatol Surg Oncol. 1989 Jun. 15(6):652-6. [Medline]. Zemtsov A, Wilson L. CO2 laser treatment causes local tattoo allergic reaction to become generalized. Acta Derm Venereol. 1997 Nov. 77(6):497. [Medline]. Ashinoff R, Levine VJ, Soter NA. Allergic reactions to tattoo pigment after laser treatment. Dermatol Surg. 1995 Apr. 21(4):291-4. [Medline]. Reddy KK, Brauer JA, Anolik R, Bernstein L, Brightman L, Hale E, et al. Topical perfluorodecalin resolves immediate whitening reactions and allows rapid effective multiple pass treatment of tattoos. Lasers Surg Med. 2013 Feb. 45(2):76-80. [Medline]. Tanzi EL, Lupton JR, Alster TS. Lasers in dermatology: four decades of progress. J Am Acad Dermatol. 2003 Jul. 49(1):1-31. [Medline]. Serup J, Bäumler W. Guide to Treatment of Tattoo Complications and Tattoo Removal. Curr Probl Dermatol. 2017. 52:132-138. [Medline]. Serup J. Atlas of Illustrative Cases of Tattoo Complications. Curr Probl Dermatol. 2017. 52:139-229. [Medline]. Sepehri M, Jørgensen B. Surgical Treatment of Tattoo Complications. Curr Probl Dermatol. 2017. 52:82-93. [Medline]. Serup J. Diagnostic Tools for Doctors' Evaluation of Tattoo Complications. Curr Probl Dermatol. 2017. 52:42-57. [Medline]. Erythematous nodule overlying a black pigment zone. An otherwise healthy 24-year-old man presented with an erythematous nodule involving a tattoo on his right lower leg. 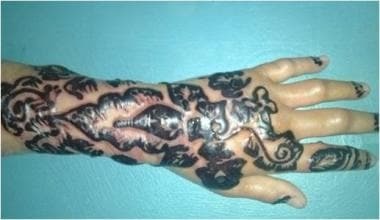 The eruption began 2 months after the placement of black ink within a previously existing tattoo. Clinical examination revealed an erythematous, freely movable nodule overlying a black pigment zone on the right lower leg, with slight tenderness on pressure. Image courtesy of the National Institutes of Health. A 27-year-old, otherwise healthy woman presented with a circumscribed inflammatory lichenoid skin reaction in an older tattoo on her foot that developed about 3 weeks after completion with red ink. The reaction was limited to those areas tattooed red but was persistent. Image courtesy of the National Institutes of Health. Pustular rash caused by Mycobacterium haemophilum confined to the tattooed region of the forearm. A healthy 44-year-old man developed a painless rash at the tattoo site three days after completion. He applied antibacterial ointment, but the rash did not resolve 12 days after onset. Erythematous nodules of 3-5 mm diameter in the region of the tattoo were noted. Photograph taken 2 months after tattooing. Image courtesy of the National Institutes of Health.